The bestselling author of The Art of Racing in the Rain presents a long-awaited new novel in which a boy trying to save his parents’ marriage uncovers a vast legacy of family secrets. In the summer of 1990, fourteen-year-old Trevor Riddell gets his first glimpse of Riddell House. Built from the spoils of a massive timber fortune, the legendary family mansion is constructed of giant whole trees and is set on a huge estate overlooking Seattle’s Puget Sound. Trevor’s bankrupt parents have begun a trial separation, and his father, Jones Riddell, has brought Trevor to Riddell House with a goal: to join forces with his sister, Serena, dispatch the ailing and elderly Grandpa Samuel to a nursing home, sell off the house and property for development, divide up the profits, and live happily ever after. But as Trevor explores the house’s secret stairways and hidden rooms, he discovers a spirit lingering in Riddell House whose agenda is at odds with the family plan. Only Trevor’s willingness to face the dark past of his forefathers will reveal the key to his family’s future. 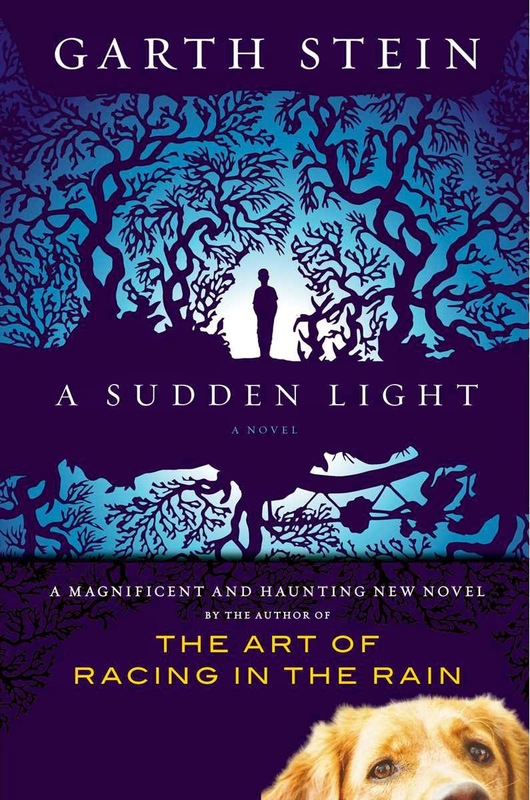 Spellbinding and atmospheric, A Sudden Light is rich with unconventional characters, scenes of transcendent natural beauty, and unforgettable moments of emotional truth that reflect Garth Stein’s outsized capacity for empathy and keen understanding of human motivation—a triumphant work of a master storyteller at the height of his power. This book completely absorbed me and I read it two sittings. It is about a young boy named Trevor whose parents are on the verge of a divorce. He travels with his father to a centuries old timber house where his grandfather lives with his aunt. His father is there to convince the old man to sell the home as it is dilapidated and too costly to fix. What Trevor discovers are old and very painful family secrets that have been long buried, the ghost of his grandmother who dances in the ball room, ancestors who died under mysterious circumstances, and the onus to right the wrongs of the past. Reading this novel is like peeling away the layers of an onion. With each page, more insight and details are revealed about the family, both those who are still living and those who have long passed. Lots of good twists and turns and surprises kept me frantically turning the pages to find out what happens next. Although the story is dark at times, there is plenty of warm emotional scenes along the way. Heart-wrenching, poignant, joyful, and a great satisfying ending make this one book worth reading. It is certain to keep you well entertained. Garth Stein is a master storyteller! Excellently written! True enjoyment!